It's finally here, my 2018 taxes broken down for you. See how my tax report this year stacks up against the one from last year. (Biglaw Investor: Well, this is a little later than I expected. Sorry, folks. Even though tax season is behind us, I hope you find it helpful to see how much I paid). Belated Happy Tax Day! It’s another year in the books and another chance to review my taxes. Last year I told you how much I paid in the 2017 Tax Report and I’m excited to rerun the numbers. I hope you find it interesting and helpful as you plan your taxes. Taxes aren’t saved when you file them but every year as you prepare for the next year, so ultimately this post is about saving money in 2018. 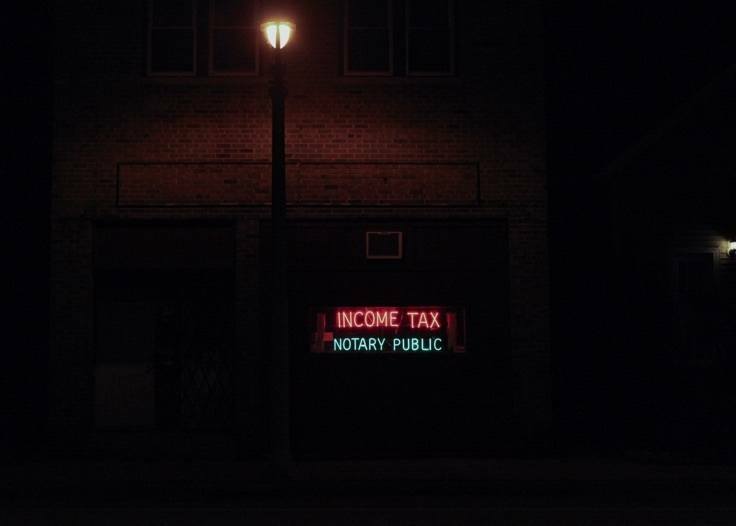 For many years I’ve done my own tax preparation. I’m sure this saves a little money, but I mostly do it to learn the tax code. Every year I become familiar with a new form and this year was no different since I filed my taxes as married for the first time. Let’s dig into the numbers. Here’s how I did this year on my taxes and what I’m planning on doing for the coming year. This year had some significant changes to our tax profile. Instead of filing two separate returns as single taxpayers, we got married and started filing as married filing jointly. We’re one of the couples that benefit from filing as married rather than single thanks to the salary disparities (more of my income gets taxed in the lower brackets). The New York Times has a great graphical tax tool where you can see how you fit into the marriage penalty/bonus. But I wouldn’t spend too much time thinking about the 2017 tax brackets since the Tax Cuts and Jobs Act rewrote many parts of the tax code. While not eliminating the marriage penalty, the TCJA did set the Married Filing Jointly tax brackets at precisely double the Individual brackets, thus reducing the marriage penalty for middle-to-high income earners. 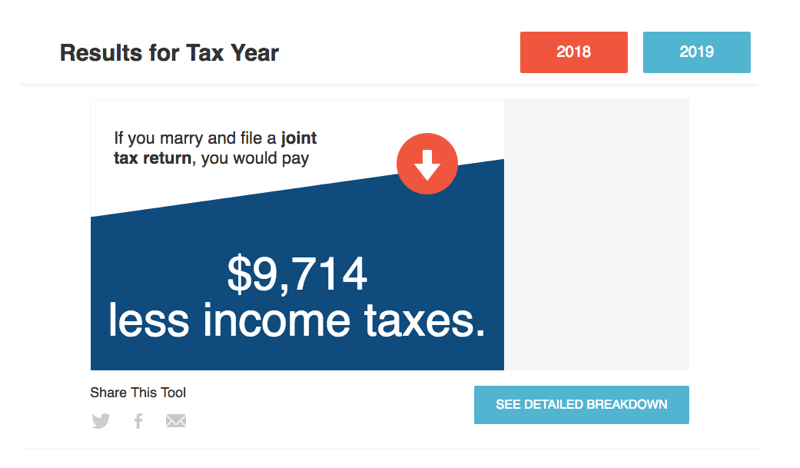 The early results for next year (i.e., 2018 taxes) suggest that we’ll save about $9,714 by filing our taxes as married rather than as two individuals. You can run your numbers here. But it’s not just federal taxes. Living in a high cost-of-living city means I’m subject to substantial taxes at all angles. This means it takes a small amount of extra work to figure out my effective tax rates each year. I don’t just want to trust the number from Turbotax. To figure out my effective tax rate, I use my total gross income as the denominator. To calculate your total gross income, start with Line 22 of your 1040 tax return (i.e., your total income). Now add all retirement contributions (401(k), 403(b), 457(b), etc.) plus all of the exempt wages and section 125 wages. Those additional exempt wages are things like healthcare insurance premiums, HSA contributions and qualified transportation expenses that come out of your paycheck and are not reported in Box 1 of your W-2. My W-2 statement has a helpful box at the end detailing my “gross wages.” See if yours does too. If you don’t have a year-end summary on your W-2, you can figure out your exempt wages by opening up your last pay stub and looking at the total contributions made to retirement accounts, healthcare insurance premiums, HSA contributions and qualified transportation expenses. The numerator is simply the amount of taxes I paid. Enough with the preview. How much did I pay? (1) I paid less in Federal, State and City taxes this year than in the previous year. For my State and City taxes, that’s the fourth year in a row that I’ve been able to lower my tax burden. More on that later. (2) Being married understandably increases our Payroll taxes as we’re now having to pay up to the maximum under Social Security twice, rather than being capped at the maximum amount an individual is required to pay when I only looked at my tax return. (3) The percentage paid to the federal government seems lower than you’d expect if you just looked at the tax brackets (we’re in the 33% bracket). (4) It’s not cheap to live in NYC. This year I took the time to separate my New York State and New York City tax payments (as well as update my spreadsheet historically) rather than combine the numbers as I did last year. While I paid 5.54% to New York State, it’s the additional 3.10% paid to New York City that is the surcharge for living in NYC. Shout out to my Texas Biglaw lawyers earning the same salary but paying zero in state and city income taxes. That’s a significant amount of extra cash you’re keeping. (5) The Obamacare additional Medicare tax is pretty small. I’d love to know what it would be if we had universal healthcare. I’d be okay to swap my health insurance premiums for an increase in taxes. (6) Total taxes paid are now approaching my starting salary as a first-year associate. Unbelievable! (7) The overall effective rate of 34.42% is an incredible 1.85% lower than I paid last year despite the fact that our income increased by a considerable amount. The 34.42% effective tax rate is also lower than the effective tax rate I paid as a first-year associate. That’s the benefit of the marriage bonus along with some other maneuvers discussed below. (8) One thing to keep in mind is that my actual effective tax rate is even lower than the number above. I generate a lot of income in retirement accounts. The interest, dividends and capital gains in those accounts do not show up as income on my tax return, and I plan on keeping it that way. Tax software is a great way to figure out your marginal tax rate each year. If you add $1000 to your earned income and then measure the changes to your federal and state taxes, you’ll be able to calculate your marginal tax rate. If you add $1000 to my income, my federal tax + payroll goes up by $350 and my state and city taxes go up by $117 for a total additional tax due of $467. Therefore, my marginal rate is 46.7%. That means each additional dollar earned will see 47 cents paid in taxes. The flip side is also true – each dollar saved in a pre-tax retirement account will reduce my tax bill by the same amount. With such a high marginal tax rate, I’m highly motivated to take of each marginal dollar at the top of my income. Something as simple as buying a $100 monthly transit pass with pre-tax dollars will save me $47 in taxes (which means $47 actual dollars in my pocket). While it’s fun to look at my numbers, the most emailed question I receive is asking for help on what you can do to reduce taxes and drive down your effective tax rate. I’m all about figuring that out too, which is why I put together these reports. Retirement accounts require effort to set up. You’ve got to fill out the paperwork and make decisions on how much to contribute and where to invest. But once you start building up cash in tax-advantaged space, it becomes apparent pretty quickly that they are good for your finances. Generally, I’m always looking for more tax-advantaged space and trying to make decisions that give me access to more retirement accounts. It first started with the 401(k) followed quickly by the Backdoor Roth IRA. Once I switched to a firm that offered a High-Deductible Health Plan, the Health Savings Account became the next retirement account available to me. After that, I worked with my spouse to shift some income so that we could max out her retirement accounts as well. This year the blog even generated enough money to warrant opening up a retirement account! If you also want to pay less taxes, you should figure out a way to defer paying taxes on $62,159 of your income. Sharp readers will note that we didn’t quite max out my wife’s retirement accounts thanks to some payroll troubles. Oh well, we got close. We’ll hit 100% of our contributions this year. While I will eventually have to pay taxes on the amount contributed to retirement accounts, I am very confident that I’ll be able to access it at an effective tax rate that is significantly lower than my current 46.7% marginal tax rate. Saving taxes at 46.7% and then paying them later at 20% is a winning proposition every time. Nobody likes losing money, but when you do the government and taxpayers are willing to share in your loss. Thanks to a few times where I swung for the fences early in my career, I have carry-forward capital losses that I can apply against my current income. I also take advantage of tax-loss harvesting to generate additional paper losses (although there wasn’t much of that in 2017). This allowed me to deduct $3,000 against my income this year and I have capital losses that will carry forward for the next few years. My W-2 has a helpful table on the last page that shows me my “gross wages” which includes not only the compensation reported on Box 1 of my W-2 but things like HSA contributions, health insurance premiums and qualified transportation expenses (i.e., monthly commuter card). Excluding 401(k) and HSA contributions, we were able to shelter another 1.2% of our income through participation in the various benefits offered by our employers. That may not seem like much, but it resulted in over $2,000 saved in taxes, all of which ended up getting contributed to taxable investing accounts. While charitable giving was lower this year than I would have liked, if you’re itemizing your deduction (most of you in Biglaw), don’t forget that all of your charitable contributions are tax-free (or, were tax-free). It’s very likely that we won’t be itemizing our taxes going forward now that state and local tax deductions are limited to $10,000 under the Tax Cut and Jobs Act. Going forward, this has the unfortunate side effect of disincentivizing charitable giving. I’ll have posts up in the future about the TCJA, a topic I’m excited to cover. Part of doing my taxes each year is learning what didn’t help, even if it seemed like the right decision at the time. Here’s what didn’t help lower my tax bill. Typically, you can add your state and city tax payments to Schedule A as part of your itemized deductions. Including those taxes on Schedule A is helpful since it prevents you from paying federal taxes on the money that is paid to state and city governments. So, one would think that living in a high state and city location has at least some benefits. However, that’s wrong. The Alternative Minimum Tax effectively eliminates a taxpayer’s ability to claim state and local tax deductions, so those deductions haven’t been helpful to me for years (I’ve been paying AMT since 2012). Their only value has been helping me cross the threshold for itemizing deductions, therefore making other Schedule A deductions more valuable than they would be if I were taking the standard deduction. Early in my career I looked forward to seeing capital gains and dividends added to my taxable account. When those deposits showed up, I felt like an actual owner reaping the reward of corporate profits. Now I realize that it’s unfortunately unneeded income during a phase of my life when I’m in a high tax bracket. I’d be more than happy to defer this income, but the dividends keep rolling in. At my income level, your deductions start to phase out thanks to Donald Pease and the phase-out. This is just an extra 3% tax on high-earners, and there’s nothing I can do to avoid it. If you completed a Backdoor Roth IRA this year, here’s my annual reminder to make sure the tax software correctly filled out Form 8606. Form 8606 shows your Backdoor Roth IRA contribution, and you want to make sure Line 15 (Taxable amount) shows $0. You can save a lot of money on taxes if you’re able to shelter $75,824 of your income from federal, state and city taxes. I’m always looking for more ways to stuff money into tax-advantaged accounts and only expect this number to grow each year. Overall, I’m pleased with the progress I’ve made over the last right years in keeping my tax bill as low as possible. I look forward to continuing the challenge next year! Look for future posts from me discussing the Tax Cut and Jobs Act, along with what I’ll be doing in 2018 during the year to take advantage of the new tax code. Unless I’m missing something, you should be able to put $6,850 in your HSA now that you’re married. I don’t have family coverage under my HDHP. It’s just me. My wife stayed on her government plan, so I can only contribute the $3,450. In good news though, I could use those HSA funds to pay for my wife’s qualified medical expenses even though she’s got a traditional healthcare plan! Great post Josh. Tax is often overlooked in financial planning. Far too often people’s due diligence ends with lowest fees charges in the investment and don’t see it through to the tax portion of the calculation. Well done, Josh. Thank you very much for sharing your numbers, I picked up on a couple of items I need to revisit myself. This is what makes this PF community so valuable. 15 minutes to read this post, gain insightful advantages and with a few changes and tweaks…BAM!! A couple of hundred, if not a $1,000+ is gained. My thoughts exactly Church. So much to learn!